Last week was super rainy/windy/cold and I had more meetings than usual, so there was little time or motivation to get out for new experiences for much of the week. I made up for it on Friday, however, with a few new experiences. I first stopped into the Pilchuck Pop-Up store. First, how can one resist a pop-up? Okay, I have very little experience with pop-ups, but I love the concept. Second, I love blown glass, so it was a treat to see beautiful glass objects. Third, Christmas shopping season - this particular pop-up store was specifically put together with gifting in mind. And, finally, I just love the word Pilchuck. Say it out loud a few times and you'll see just how wonderfully it rolls around the tongue. As I learned as I explored the space, the Pilchuck Glass School has a long and prestigious history, which you can learn more about on their webpage or by visiting their Seattle exhibition space in historic Pioneer Square. I didn't buy anything at the pop-up, so continued on to a place where I've been wanting to visit for ages and knew that I'd find something to buy: Intrigue Chocolates. As soon as I walked in I was asked if I'd like to have a chocolate tasting. Um, is that a rhetorical question? And, after tasting, the question was not whether or not I was going to buy chocolate, but rather, how much. I walked out with a 12-truffle variety pack for a gift, a small treat for me for later, and a punch card. And the final experience of the day was easily my favorite: Holiday Ships! 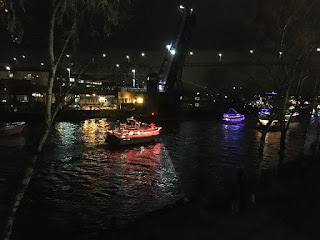 I live about 1/2 mile away from the Fremont cut and Lake Union, love holiday lights and carolers, and yet, before Friday night had never made a point to see the ships before. 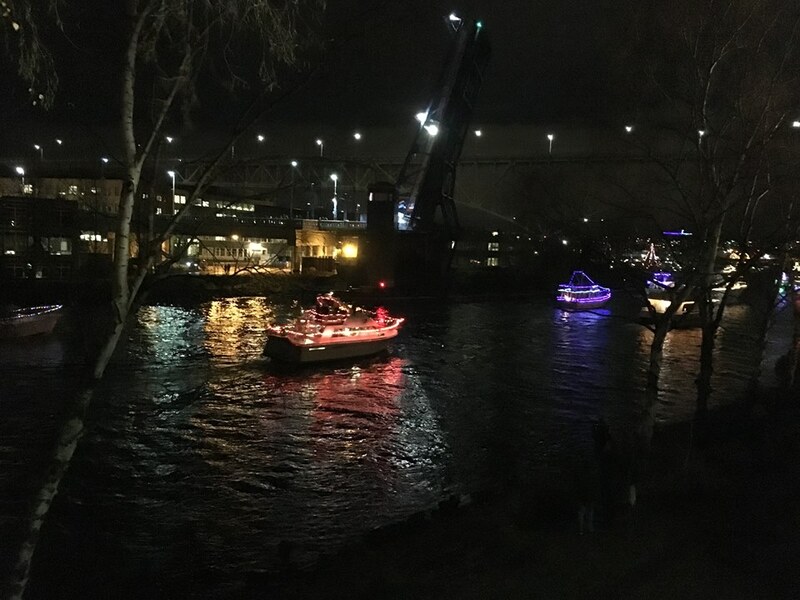 There are a few Argosy boats that are decked out with holiday lights carrying choirs that travel different routes on the evenings in the weeks leading up to Christmas. One can buy a ticket on the boat (if one plans far in advance and wants to shell out a fair amount), or find a place on shore near one of the locations where they stop and the carolers sing a few songs. Other boats can join in the festivities and follow the lead boats in a holiday parade of ships. Friday night they had a route that included the Fremont cut and Lake Union, so Jeff and I made a point of hanging out in Fremont after work (which included cider at Shilling and sushi at Blue C) and then found a spot on the Queen Anne side of the cut to watch the ships. We arrived just in time for Handel's Messiah (!!!!) and the entire parade. Boats ranged from yachts to dinghies to tall masted sailboats with at least one kayak in the mix. And, despite a rather rainy evening, we had a break in the rain for the show and the short walk up the hill home.